WHAT’S NEXT FOR RICK WARREN? Especially considering that in 2010 Warren, the General of the Seeker Driven Army, would be handed a pass via John Piper right into the wider evangelical community. Then this year Acts 29 Network, founded by Mark Driscoll, brought Warren’s work even deeper into the younger sectors of the Reformed camp through their R 12 conference. You may also recall that just yesterday in Rick Warren On Oprah’s Lifeclass Again February 24th I gave you even more reasons why Warren’s questionable associations are wrong. Now, against this necessary background, please understand that this is not to be construed as an over-all recommendation of his work as Roger Oakland and I would have our differences. Being purpose driven is the phrase that has been coined to explain how to be motivated and make a difference in the world and the church. Warren’s P.E.A.C.E. Plan is designed to work together to solve global problems with global solutions by uniting global religions to work together for the cause of good. The only question that remains to be answered is what will be the next level of indoctrination that will comply with Warren’s agenda to influence the world and the church?…Warren’s three-legged-stool plan that involves the cooperation of the world’s governments, businesses, and religions has not yet been perfected. While Warren has positioned himself with relationships with world leaders like former Prime Minister Tony Blair of England, who has a similar interest to unite religions together for the cause of peace, there is much more to be done. So, what is next? In my view, this is what to expect. The Purpose Driven P.E.A.C. E. Plan will become an even more important emphasis for Warren and Blair. Since both are willing to work together with leaders of all religions and Blair has committed to work closely with Rome since his conversion to Roman Catholicism, it is obvious where this is headed. Those who follow Rick Warren, the man, will also follow Rick Warren and his methods. I believe this will lead toward a peace plan that will eventually come under the jurisdiction of Rome under the guise of a Christianity that will embrace all religions for the cause of peace in the name of Christ. While many will believe this christ is Jesus Christ, this so-called messiah will actually be the antichrist… When we see the religions of the world coming together for the cause of peace, we should be warned according to the Scriptures. Rather than join together, it is time to be alert. Keeping in mind what Oakland brings out about Rick Warren’s sinful ecumenicism, we have real reason for concern e.g. with Piper and Driscoll’s flat-out endorsement of his false teaching. You can read Roger Oakland’s insightful commentary in its entirety right here. 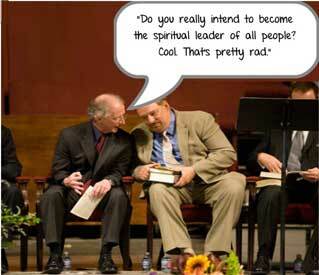 JOHN PIPER ON RICK WARREN: INVITATION TO “HANG OUT” OR AN ENDORSEMENT?